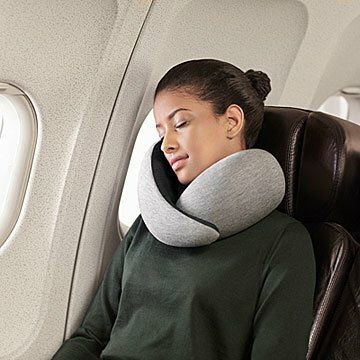 No matter the transportation or the destination, never compromise on coziness with this modern neck pillow. To all the roadtrip daydreamers and airplane nappers out there, this one's for you. No matter the transportation or the destination, never compromise on coziness with this modern neck pillow. The lightweight, stylish design wraps comfortably around your neck for top quality support and soft cushioning. Once you've completed your trip (or desk nap) the sleek wrap rolls up into a compact ball. It's basically the peanut butter to your TSA-approved jelly. Made in Spain. Remove cover and machine wash cold.